August in France is the calm before the socio-cultural phenomenon that is « La rentrée ». If there is a word in English to explain this phenomenon I am not aware of it. We could say “back to school” but that is only relevant in the sphere of education whereas in France almost everyone stops work in August so September becomes a starting block. You can easily picture the Nationwide setting of teeth which occurs when French speak of “La Rentrée”. Let us not dwell on that now, but rather the pleasant diversions of idle August. Some of us can only do so much swimming and sun bathing. Other diversions are needed for the fair of skin in the South of France. It is an oportuninty to check out neighbouring towns and cities that you hadn’t had the time to visit during the working year. The only downsides I can think of are that certain restaurants that are oriented towards locals are often closed and the streets are a little more full of tourists in some cases. I live in Montpellier. It is sometimes accused of being without soul. I understand this accusation and I would like to recommend a couple of places to visit that seem to have bags of it. Nimes, undeniably, has a visible link with past with its Roman arena, gardens and “maison carré”. Beziers, is a town that many love to hate but it is very soulfull in the manner of an old blues harmonica player. If by soulfull you mean character and if by character you mean looking like someone you wouldn’t sit next to in a bus shelter or if you mean strongly smelling of pee.. then it would fit that definition too. Give Beziers a chance. Once you get past it’s smelly, scruffy exterior, or even it’s pathetic aspirations to resemble Montpellier (see: University campus extensions/Polygone II), there are some quality spots for those who like food and wine. Apart from the annual bull festival, Beziers is not often talked about in the Languedoc. This is good news if you want it to keep its authenticity. If you go and explore the small shops, restaurants and cafés there you will often be awarded with lower prices and real local products. The “Biteroise” are very proud of their Occitan identity and you will see the Occitan cross and colours splashed all over the town. The inhabitants are also closer to their roots as a wine making culture and you will be spoiled for selection and price of quality regional wines there. One sure bet is ‘Le Chameau Ivre” or “drunken camel”. A wine bar and cellar which literally has a selection second to none. Their menu looks more like a phone book. The establishment’s name is a reference to the town’s emblem which is a camel. Certain food artisans have sprung up in the city who give little heed to appearance but fully dedicated to their craft. I can think of no better example than “Les Pains des Moissons” where the baker mills his own organic flour on site and then prepares all the breads, pastries and momentary inspirations single handedly. For my tastes, it is simply the best available in terms of bread and pastry. Nimes, on the other side of Montpellier, has some very obvious draws relating mostly to its historical importance. At one time I thought that much of Nimes was actually quite grim. That was because I often found myself walking near the arcades, the arena or the train station at night. I suggest enjoying the touristy spots in the day. Between the art gallery, ancient buildings and beautiful gardens you are spoiled for choice. In the evening the interesting activity happens in the narrow streets in the old city’s core. There are enough good value and lively restaurants and tapas bars to keep you merrily occupied on the smaller streets like ‘Rue Fresque’ so that you don’t need to go and be exploited like the sunburned Americans you will have seen in the day at the tourist sites who will invariably go to one of the central squares to eat overpriced, slapped together food. One delightful restqurqnt freauented by the Ni;oise is Flan Coco. The speciqlity of Nimes is Brandade which is cod pureed with olive oil and cream and, usually, spread on bread or potatoes. 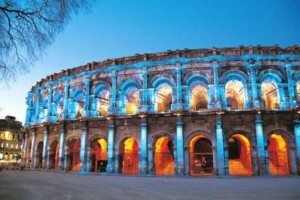 Both Nimes and Beziers offer good value city breaks in proximity to Montpellier. While the former gives immidiate aesthetic gratification to its visitors, Beziers yields little known pleasures reluctantly to explorers wanting to get under its seedy exterior. Wow, I have lived in Montpellier for ten years and have absolutely never heard it described as being without soul! Not by French or foreign people. I was really surprised to read this.